ST DUTHUS turn their attention to cup action this weekend, much further afield, as they travel up the A9 to Halkirk's Morrison Park to meet Shetland FC in the first round of the Football Times Cup. Shetland Football Club were first formed in 2013, although representative teams from the Shetland Football Association have competed for many years, starting with an intercounty fixture against Orkney in 1919. Since that time, they have played regularly in the Island Games, meeting teams from as far away as Guernsey, the Isle of Man and Jersey, all the way to the Faroe Islands, Gibraltar and sunny Menorca! The 2013 club was formed with the aim of competing during the domestic winter season and at the 2013/14 AGM of the North Caledonian League, they were accepted as entrants in to the North Caledonian Cup. The club earned its first silverware the following season when they won the Jock Mackay Cup, but were forced to withdraw from the competition in 2015-16 owing to a series of postponements. 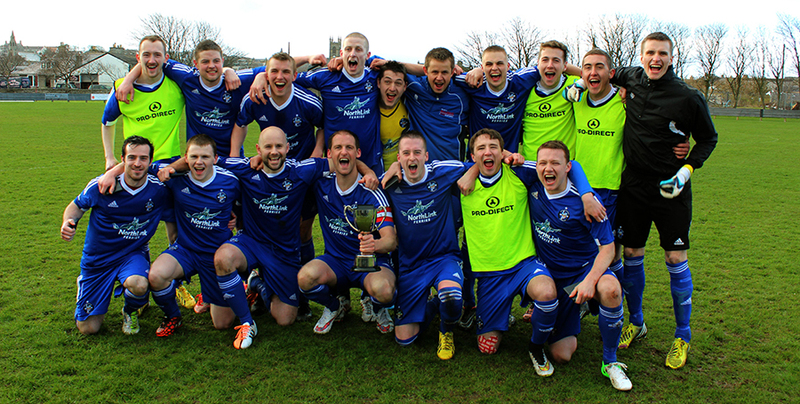 For the current season, Shetland have entered both the Football Times and the Jock Mackay Cup. In something of a last minute twist, the "Shelties" begin their campaign without a team manager. Shetland's "home" ties are usually be played at the home ground of the Vikings, Thurso FC - at the Dammies. However, due to ongoing works, Saturday's game will be played at Halkirk's Morrison Park. For the Saints, the continuing North West Sutherland amateur calendar continues to hamper team selection as manager Stuart Ross ponders his side for the trip to Caithness, but options have certainly been enhanced by the superb performance shown by those who played at Invergordon. "It was great to see St Duthus back on the park last weekend. It was a great effort from the boys which made for a fantastic start to the season. That will hopefully now give us a strong footing moving forward and we're excited to be able to hit the road with the boys for what will be our first road trip together, so plenty to look forward to." "Shetland will no doubt bring a very strong team to the Mainland for the game and we look forward to competing against them in what will also be a first for us as a club, travelling north to play an Islands team in a cup game. We're hoping to be able to welcome Graham Noble, Scott Miller, Paul Cowie, Garry Macleod and Ken Morrison back into the fold, to name a few. Numbers continue to look good for training also, so we should have a good pool to pick from allowing us to send a team we hope can compete in this first round tie." The game kicks off at the earlier time of 1.30pm. We hope that Stuart and the boys can look forward to a good traveling support backing the Saints on the day for what will be a tough game.